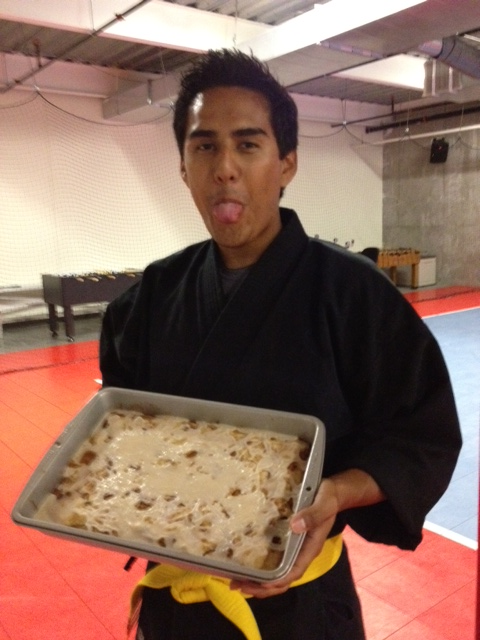 Banzai Birthday: Snickerdoodle Bars for Alex! Banzai to Alex! 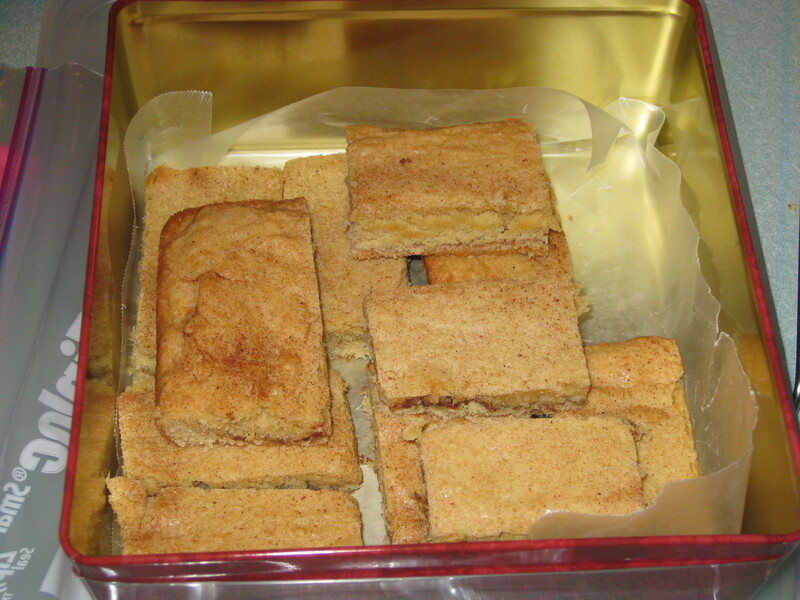 We celebrated Alex’s birthday with these cinnamony Snickerdoodle Bars. They have the flavors of a snickerdoodle cookie without all the effort and patience required to roll the dough into balls and then dip them in cinnamon sugar. (Have I ever mentioned I’m not the most patient person?) Once the bars are baked a simple sugar glaze tops them off. This is one of the few recipes where I could just eat the batter off a spoon! I don’t say that often because I don’t like batter or raw dough, but there’s just something about these that I find irresistible! If you’re a cinnamon and vanilla fan, you need to try these! Click for recipe. I found this recipe at Grin and Bake It awhile back and made a pan for The Pretty One to take back to school. He had to take them – – if I had kept them for myself, I would have eaten them all within a day! The Pretty One is a veteran snickerdoodle taster and raved about these, so I knew they were good. I even forgot to put on the glaze and neither of us missed it! When I asked Alex what he wanted for treats, he told me he prefers vanilla over chocolate “if it comes to a cake-like creation” but didn’t specify anything other than that. Since these were so good the first time, I thought they’d be something the Karate Club would enjoy. There’s not much to this recipe, and maybe that’s the key to it. The vanilla batter layered with the cinnamon sugar filling really work together for an enjoyable treat. The most wonderful aroma will fill your kitchen when you bake these! Heat oven to 350. Spray or grease the bottom only of a 9×13-inch pan with cooking spray. Combine sugar and cinnamon for cinnamon-sugar filling in a small bowl and set aside. With an electric mixer, beat butter on high speed until creamy. Beat in sugars. Spoon half the batter into the pan and spread evenly. Sprinkle with cinnamon-sugar filling evenly over batter. Dollop teaspoons of remaining batter evenly over cinnamon-sugar filling. [You won’t be able to spread it!] Gaps are okay. The filling can peek through. Bake 20-25 minutes or until golden brown and a toothpick inserted in the center comes out clean. Cool completely, about 1 hour. In a small bowl, stir glaze ingredients until smooth and thin enough to drizzle. Drizzle over bars. « Banzai Birthday: Chocolate Banana Cupcakes!